As part of our Products Series with 6 Days of Kasha we’ve got 6 gift ideas for just about every member of your family on your list this festive season. In true Kasha style, the quality of products we offer you is of utmost but don’t worry, we know the year is nearly over and there’s so many goals you have for 2018, that’s why we’re here to remind you that gifting and sharing love doesn’t need to break your bank. 6 Days Of Kasha looks to make your shopping experience easier, more convenient and of course, enjoyable- just as gifting is! For 6 Days throughout December, Kasha will highlight our favourite ‘things’ including a range gift boxes, women who inspired us and moments at Kasha to give you a little insight on the hard work that goes into day to day operations at Kasha as well as the laughs that continue to build our team. It’s that time of the year to make sure we get the best deals for our families upcountry. Which products will they get the most use out of? Which products can the whole family share? So many questions all of which we have an answer for. Our gift to you this Christmas is this list we’ve put together of items we know your family will love the most that you can order and have delivered at your doorstep just in time for your trip upcountry. Perhaps a back-to-school kit for your little cuz is just what you’re looking for In this gift package, you can include a good amount of Shuya Sanitary Pads, a new generation of sanitary pads that are suitable for menstrual care but are also useful as preventative help for various gynaecological conditions. These ‘modern day’ sanitary pads are loved by our naturalista sisters and include active oxygen, far IR and anion making them extra breathable, leak-proof and highly absorbent while giving you the care you deserve during the special time of the month. You could be thinking of getting gifts for your aunties who tirelessly care for cucu with little time or mind space to indulge in their favourite personal care products for themselves and the whole family. 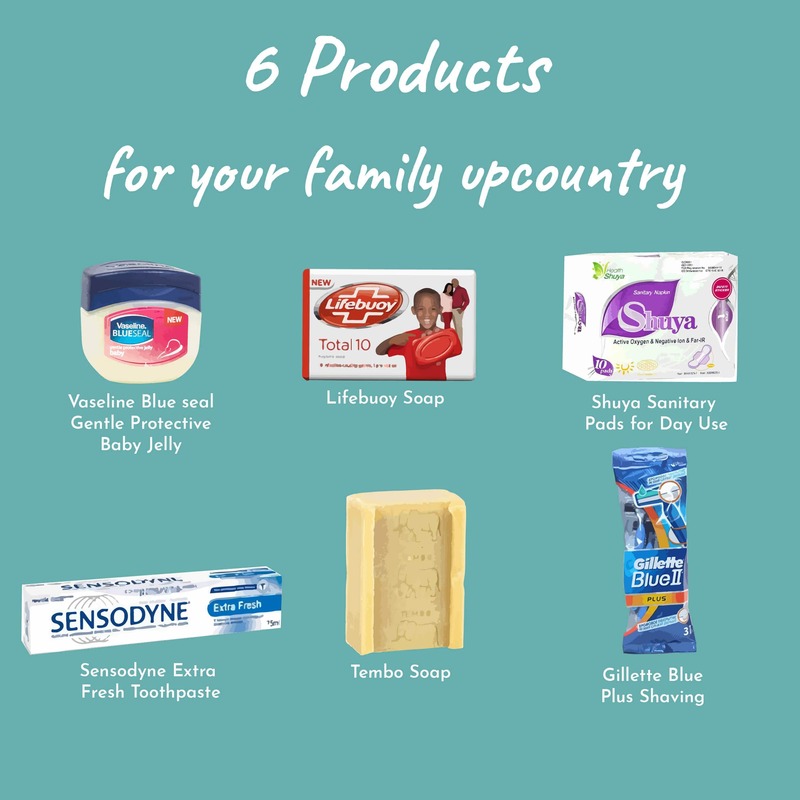 This is your perfect chance to support the importance of personal care for the whole family and include products suitable for all including baby such as Vaseline Blueseal Gentle Protective Baby Jelly and Lifebuoy Soap or add a few pieces of your preferred scented Geisha products which ensure an enjoyable bathing time everyday. Sometimes, there’s only room in your mind for a fleeting thought when it comes to scheduling a trip to the kiosk to get your personal care necessities. What if you show your favourite uncle that you’re aware of his busy day by adding the Rexona Men Antiperspirant to your gift hamper and just a few tubes of the best cavity fighting toothpaste Pepsodent Toothpaste to keep his teeth colgate white? What’s most exciting is that you can personalise this hamper to suit your family’s needs even better! We share these products just to get your inspiration flowing and hope you have fun selecting from our variety of products to create your ideal gift box.